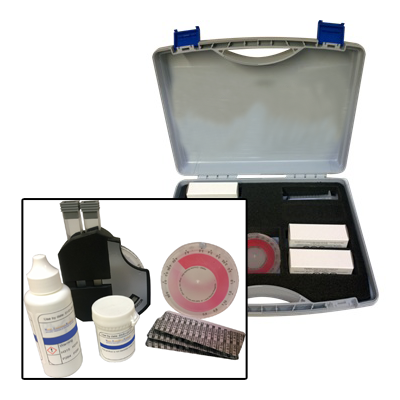 A comparator test kit that can be used to measure chlorine dioxide in system waters. The 0-6.65ppm test kit is ideal for measuring chlorine dioxide in potable water and when it is dosed continuously or where checking for any residual. It can be used over the 0-1ppm test kit when a higher range is required. The comparator test kit can be applied for regular and careful monitoring of water systems. Our Test Kits can be ordered individually or in bulk. They can be delivered alongside your WTP Chemicals’ order saving you additional delivery charges. Next working day delivery only £8.49 (up to 20kg); mainland UK only.